Chris Raymond Gatling was born September 3, 1967 in Elizabeth. Chris was hard to miss walking around his hometown. He stood 6-10 and had plenty of meat on his bones. On the court for Elizabeth High School, he was also recognizable by his shaved head and wide headband. He wore it to remind himself how lucky he was to have survived a head injury as a teenager. He still bears a long scar from that day when he fell off the back of a truck. After a standout prep career, Chris was recruited by Pitt. But after a year with the Panthers he transferred to Old Dominion. In three varsity seasons with ODU he set a school record for career shooting percentage and ended up among the Top 10 all-time in points and rebounds. He had a dozen 30-point games as a member of the Monarchs. 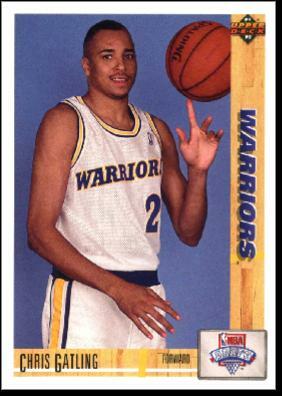 That was enough for the Golden State Warriors to spend a first-round pick on Chris in the 1991 NBA Draft. Chris played sparingly as a rookie, but earned more and more PT as an effective Sixth Man. He could handle the center and power forward positions, and shot well enough to hold his own on the wing if necessary. Among his more memorable moments for the Warriors was the time he shook Shawn Kemp’s hand after Kemp posterized him with a monster dunk. Fans also remember him for his Energizer Bunny and Tasmanian Devil tattoos. Chris could be relentless when a loose ball was up for grabs. In 1994–95, his fourth season, Chris made 324 of his 512 field goal attempts to lead the NBA with a 63.3% shooting percentage—50 points higher than runner-up Shaquille O’Neal. The following season, he finished second with a 57.5% mark. That year was his last with Golden State. The Warriors traded him to the Miami Heat with 24 games to go. Thus began a basketball odyssey that saw him play for eight NBA teams. He was a member of the Heat on three separate occasions. It’s not that teams wanted him or didn’t want him. In the salary-cap obsessed NBA trading market, he was a handy guy with a mid-range salary whose inclusion in deals just seemed to make things work. Chris didn’t exactly fade into obscurity after leaving Golden State. In 1996–97, he averaged close to 20 points a game for the Dallas Mavericks and was selected to play in the NBA All-Star Game. He played 12 minutes and heaved up a shot almost every time he touched the ball, finishing 1-for-8. In 1999–00, Chris led the NBA with 85 games played, having split the season between the Magic and Nuggets. Chris played his final NBA game in 2002 for the Heat. After his NBA days, he wanted to keep living the life, so he crossed the Atlantic to play pro ball in Russia and Italy. Post-hoops life was not particularly kind to Chris. Like many former athletes he did not handle his money well and has struggled to establish himself in a new career. All images on this site are from the collection of the authors. They are used for educational and informational purposes and our subject to standard copyright laws. Copyright © 2018 Upper Case Editorial Services, LLC.